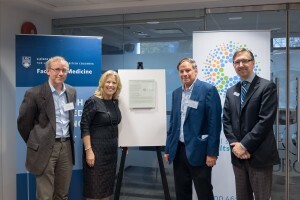 L-R: Orson Moritz, Sharon Colle, Robert Molday, and David Maberley celebrate leading gifts to UBC from the Foundation Fighting Blindness. Four decades ago, a small group of families scattered across Canada living with retinal eye diseases came together to spur sight-saving research. For most of its existence, the Foundation Fighting Blindness has channeled that hope, belief and determination to vision scientists at UBC, renewing funding year-after-year for several investigators in the Department of Ophthalmology and Visual Sciences – donating a total of $2.8 million. The first beneficiary of peer-reviewed funding by the Foundation Fighting Blindness at UBC was Robert Molday, who received a grant in 1986 to investigate the molecular basis of normal vision. At the time, his lab was the only one at UBC studying the genes and proteins involved in the visual system, and specifically in rod and cone photoreceptors. As Dr. Molday, now Professor, Canada Research Chair in Vision and Macular Degeneration and Director of the Centre for Macular Research at UBC, learned more about the visual system with support from the Foundation Fighting Blindness over the years, his focus shifted to identifying the genes and mutations that cause retinal degenerative diseases such as retinitis pigmentosa and Leber Congenital Amaurosis (LCA). By 2008, he was a leader in the field of retinal gene therapy. At this time, the world’s first test of retinal gene therapy was conducted in patients with LCA linked to mutations in the RPE65 gene. Today, Dr. Molday continues to work on critical preclinical studies with hope that they will enable gene therapies for other retinal degenerative diseases such as Stargardt disease. Dr. Moritz received his first new investigator fellowship from the Foundation Fighting Blindness when he launched his own lab at UBC in 2003. With ongoing support, he went on to explore the mechanisms of secondary cone degeneration and regeneration in retinitis pigmentosa. Bolstered by another grant from the Foundation Fighting Blindness, Dr. Moritz is currently investigating a synthetic compound called valproic acid as therapy for this inherited, degenerative eye disease. Over the decades, the Department of Ophthalmology and Visual Sciences has grown to include more than 20 clinician-scientists with collaborators across UBC and internationally, all dedicated to advancing knowledge and applying new discoveries for the improvement of eye care. Today, the Foundation Fighting Blindness continues to provide support for the research of Dr. Moritz and other UBC scientists who are investigating novel approaches to prevent and treat blindness. For example, Assistant Professor Mahyar Etminan demonstrated a statistical connection between oral fluoroquinolones (a type of antibiotic) and retinal detachment, informing a recent recommendation by Health Canada to change the warning label for these medications, widely used to treat bacterial infections. Professor Kevin Gregory-Evans, the Julia Levy BC Leadership Chair in Macular Research, has received several grants from the Foundation Fighting Blindness to investigate new molecular approaches to treating common retinal diseases. Also with the foundation’s support, Professor Cheryl Gregory-Evans is developing a drug administered by eye drop, Ataluren, to preserve sight by fixing genetic mutations that cause certain inherited eye disorders. Ataluren is currently in clinical trials for the nonsense mutation that causes the rare birth defect of aniridia. She is also testing this drug to see if it can repair LCA and Usher’s syndrome, in collaboration with Dr. Kevin Gregory-Evans. Ultimately, they aim to pursue a personalized medicine approach that uses a patient’s stem cells to determine whether the drug will restore this patient’s vision.